Welcome to the first ever Crop Circles blog hop. We are a group of crafters who share ideas and inspiration on all kinds of projects. Most of us are either Newfoundlanders or have a link to the Island. I was fortunate to be invited to join Crop Circles by my friend Michelle Marks who lives in Corner Brook. 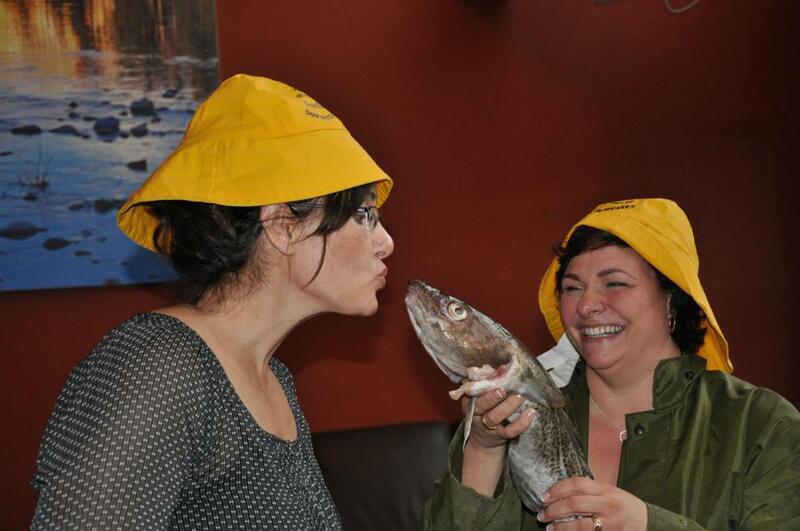 Although Michelle calls me a “Mainlander,” she screeched me in last fall when I visited her and kissed a cod. That alone should grant me a lifelong membership in Crop Circles! If this design looks a little familiar, it’s because I posted my layout here last Friday. That’s me at age 10 dressed up for a Mother’s Day contest. To read more about the story behind this photo, please click HERE. I challenged myself to use mostly embellishments an only one piece of 12 x 12 paper for this design. Wow. That was tough! But I purchased a package of embellishments that one of my local scrapbook stores sells called TM Exclusives. Michelle Marks sent me this tea set die cut. Love it! For every comment you leave along the hop, you will be entered to win a $50 prize package from Stampin’ Up! I also have a Bo Bunny prize package if you leave a comment on my blog and are a Follower, and there are more prize packages along the way. Here are the participating blogs. If you are hopping in order, then you came from Cheryl’s blog and will visit Rhea’s blog next. Click HERE to hop over to Rhea. Well you know I’m a big fan of your work!… and your sketches! Love em. Wish I could figure out the art of sketch drawing like your.. There always so nice!.. I seen your message about this hop on fb.. so I had to hop on over and check this out!… Boy LOTS to hop along to.. I’m sure I’m going to see some outstanding work! I have to subscribe to your youtube channel.. Its always fun to watch people you know when they make a vid. Thanks for sharing the hop information… I’m sure to love it. Your placement and selection of embellishments is always superb – you always now just the right touch! 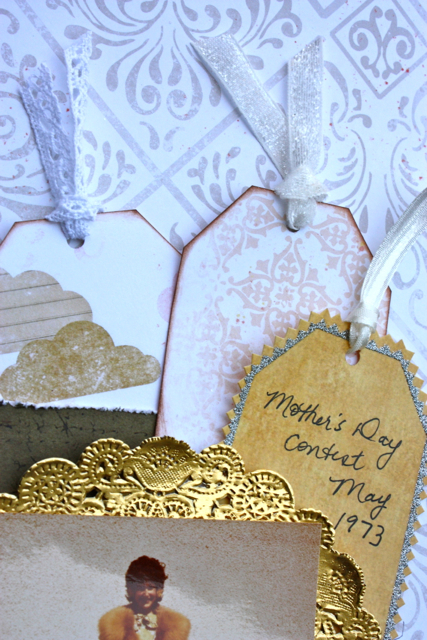 My fav part is that you used gold in your layout – not a colour that you see a lot – it works perfectly with your photo! What a precious memory to showcase! You cod kisser you!!!!! 😀 😀 I do love blog hops. It is so much fun to see what all you talented ladies do with the same sketch. I love how you’ve used the embellishments — especially the high heeled shoe and the tea set. Lovely! I loved reading the story behind the photo……I’m starting to think about showcasing my ‘younger’ life as well as hubby’s. TFS!! The layout is wonderful as is the story behind it. The picture of you is adorable! omg, I did not clue in that it was the sketch – I love this layout. 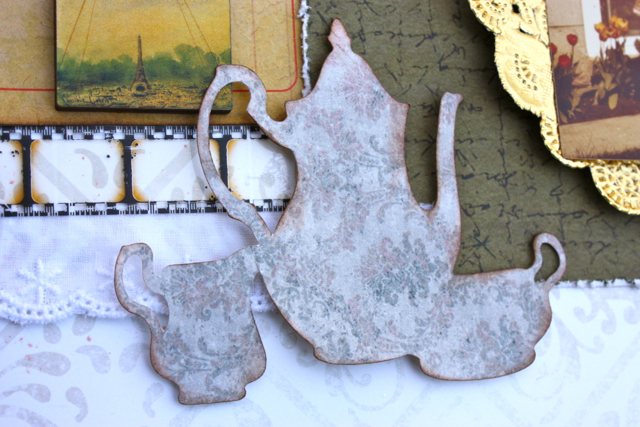 I love the picture, the gold doily and am loving that tea die! I love the stories you always have with your layouts! What a beautiful page! Love the shabby chic style, especially the filmstrip ribbon with the eyelet underneath. Gorgeous page! 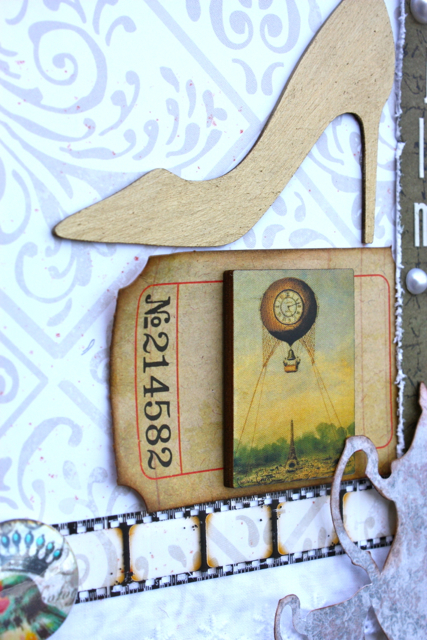 Love the shoe and the filmstrip border! Love all the delicate details on your LO! Beautiful. Oh my, I adore your layout Kelly!!!! LOVE that gold doily especially!!! Wonderful layout as always Kelly! Loving those cute little embellishments! Beautiful layout! Love the details. So beautiful, Kelly! I just love the little wood bits! Beautiful!! Lovely take on the sketch! I just love your project Kelly.. you were such a little cutie! Great details and love your design! Very vintage, Kelly. I love it. Well yes i suppose the fact that you sucked it up and kissed the cod should really count for something eh? Love your take on the sketch Kelly!Cool how you used all embellies and stuck to one sheet of pp! Kelly this is a gorgeous LO!! !I love the vintage feel to it! The use of the pearls and the gold doily is awesome!Loving that tea cup die set- certainly adds to the vintage flair of the LO. 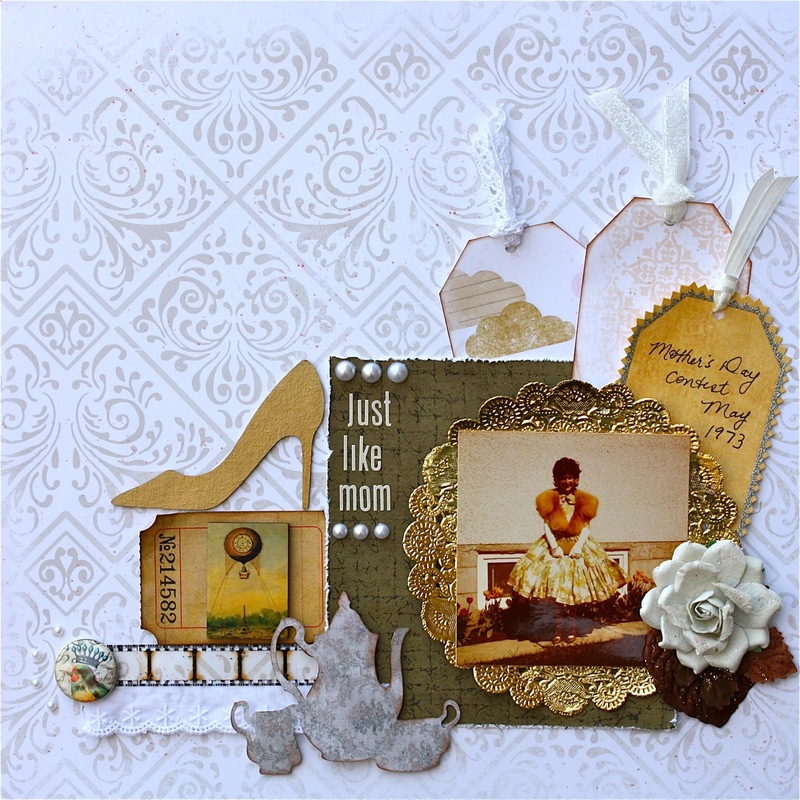 The lace, shoe, the film strip and the rose compliment the LO perfectly. This is vintage at its finest! LOVE IT! Love your layout. I see now how I could have added some ribbon. The tea set is adorable. 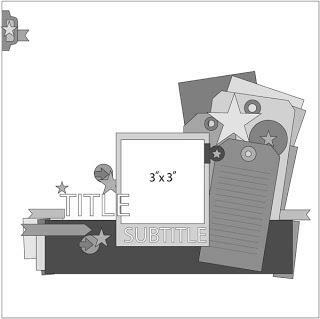 Thanks for sharing the close up of your smaller elements. Love the tags and doily. Kelly, Love this layout! 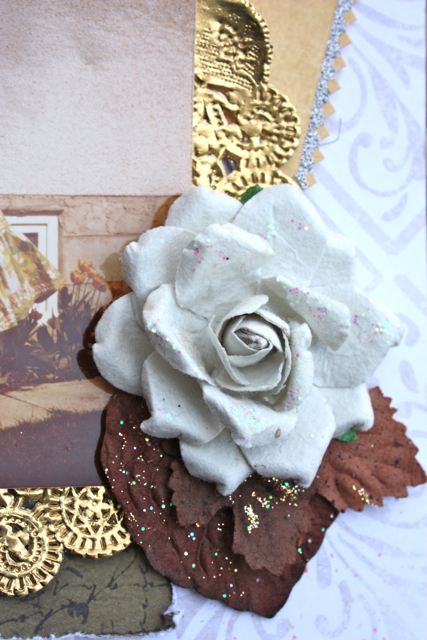 Your use of all of those embellishments on a single page is stunning! And I love that shoe! 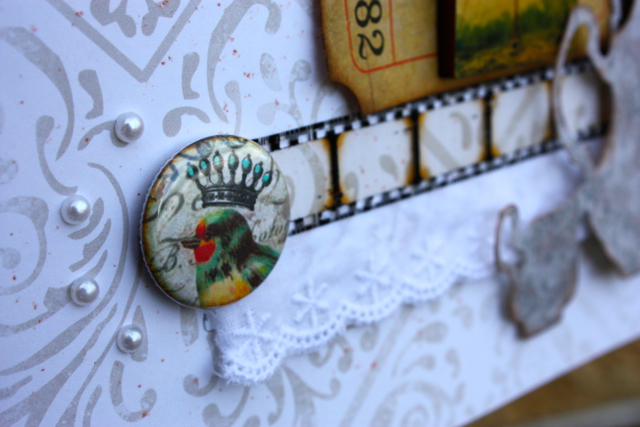 What a great combo of such interesting embellishments! You see something new each time you look at it. Terrific! Great layout! Love the touch of gold!! Love it! The gold behind the photo is gorgeous. I love this page so much, Kelly. and that photo of you is a real treasure!!! !